G R infra-project limited is one of the leading highways product manufacturing companies in the construction sector. The beam crash barrier is a most important product in the today world because it helps to provide safety to the lives of the peoples in the highways like accidents on roads and others. By the latest roll technology, the beam crash barriers are manufacturing as per the specification of the AASHTO and MORT & H. we provide the high-quality beam crash barrier to our clients. We provide the entire range of the high performance and certified beam crash barrier at the reasonable price to the clients. Our quality crash barrier can be used in the various places such as flyovers, rocky areas, bridges, high sharp curves, and much more. We are leading manufacturer and suppliers of the beam crash barriers. W Beam Crash Barrier Manufacturer in India provides the high-quality highways security products at the affordable price. w – Bean crash barrier is available in single and double side guard rail. The strength of the guard is more than two thousand kg per sq cm, the width of 300/500 mm, depth of 80 mm with the zinc coating. The total length of the w beam crash barrier is four thousand meter. 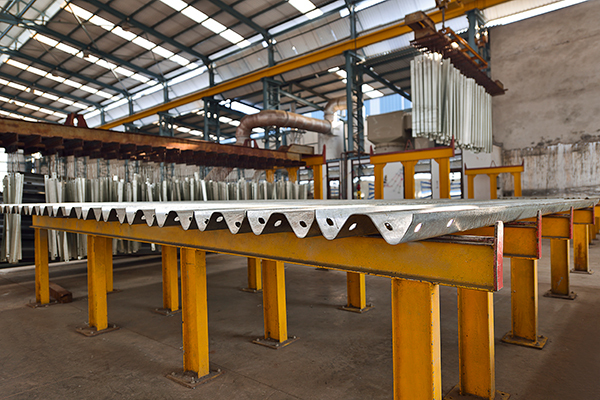 We are using the high standard machines like a shearing machine, press brake machine, roll forming machine and others to manufacturer the w beam crash barrier. One of the main benefits of choosing the leading w beam crash barrier suppliers is cost effective. The w beam crash barrier is used for the high embankments, mass housing area, parking places, and protection from the trees, railway station, automobile industry and much more. This product is easy to relocate, clean and minimum maintenance. W beam crash barrier comes with the hot dip galvanized nuts, washers, and bolts. Our product comes with the weather proof, strong, properties of fire class, durable panel and others. The W beam crash barrier provides the great visible to the drivers while driving at the night time. The manufacturers use the high-quality material to make the beam crash barriers. It is used for the wide range of the purposes such as highways, Ghats, airports, factories, and others. Revenue Block Nto. 223, Old Survey No. 384/123, Khata No. 464, Kochariya, Bavla, Ahmedabad- 382220, Gujarat India.